The purchase of a steam shower sauna makes sense for anyone who wants a luxurious spa experience but doesn’t want to leave home to get it. Who would have thought you could combine a whirlpool bath, steam room, sauna and shower all in one convenient unit? Whatever your mood or your body’s needs, you can have a range of pampering with these space-saving, watertight cabinets. If you enjoy touring new model show homes, you’ve likely seen some type of steam shower sauna included as a standard feature in the master bath. They look state-of-the-art and quite expensive, but these shower cabins are actually economical and can be installed in most bathrooms. 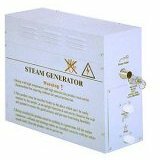 The steam generator (located within 50 feet of the unit) turns a regular shower cabinet into a steam bath and sauna. The steam does not escape into the bathroom while you’re in the unit. To dissipate the steam, you simply turn on the shower to condense the remaining steam within the enclosure and allow the runs to drip down the walls. After you step out of the unit - it self-cleans! 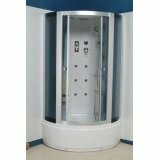 The Premium-Steam-Shower-Whirlpool-Heating unit at $2199 is one of our favorite steam shower units which offer hydrotherapy - a combination of a whirlpool and an air spa system. This steam shower includes an overhead rainfall shower head, 14-jet whirlpool bath, body massage jets, Steam Sauna with Aromatherapy, self-cleaning ozone sterilization system, foot massage system, built-in stereo speakers, hands-free telephone system, and many other extras. The-Perfect-Fit at $1999 fits in any standard bathroom and comes with all the luxurious features that come with the larger units. 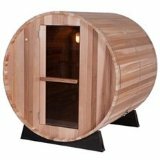 This shower steam sauna has most of the same features as the model above including hydrotherapy massage, the added bonus of aromatherapy, a whirlpool bath with 6 big and 8 small jets, and acupressure body massage jets blasting from 6 different angles. After you step out, the unit cleans itself: the ozone sterilization system kills bacteria and viruses so the next time you use it, it’s sparkling clean and ready to go. 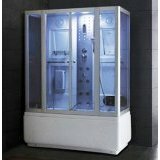 The Steamroom-Shower-Enclosure at $1200 is a surprisingly inexpensive cabinet. 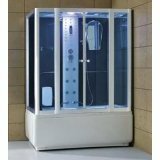 It also includes a rain shower, hand held flexible hose shower and body sprays, 3 KW steam generator, foot massage, defogger, speaker, radio telephone connection, and ozone sterilization. 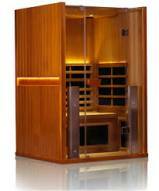 This is a free-standing shower and steam sauna with a flexible drain hook-up. Not as attractive but it gets the job done. 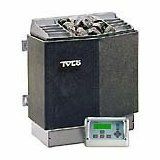 As you can see from these examples, the affordability and extensive features of these units offer outstanding value. 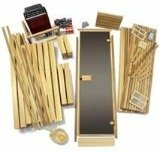 The only drawback is that they aren’t as easy to install as pre-fab steam saunas, so the installation of a steam shower sauna is best left to a professional contractor.